Besner, Neil. "The Golden Dog (Le Chien d'Or), A Legend of Quebec". The Canadian Encyclopedia, 04 March 2015, Historica Canada. 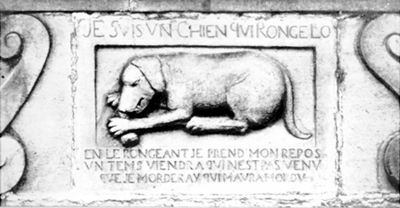 https://www.thecanadianencyclopedia.ca/en/article/the-golden-dog-le-chien-dor-a-legend-of-quebec. Accessed 25 April 2019. The Golden Dog (Le Chien d'Or), A Legend of Quebec, by William Kirby, appeared in New York and Montréal, 1877. The many legends connected with the Golden Dog all turn on revenge and end in tragedy (courtesy Metropolitan Toronto Reference Library/T34788). The Golden Dog (Le Chien d'Or), A Legend of Quebec, by William Kirby, appeared in New York and Montréal, 1877. The first edition contained many errors, and the supposedly "authorized" edition, The Golden Dog (Le Chien d'Or), A Romance of the Days of Louis Quinze in Quebec (Boston, 1897), was, according to Kirby, "a poor mutilated thing." The many other editions and abridgements are also textually unreliable. The novel's action takes place just before the fall of New France, when the supporters of the popular Chien d'Or trading house, headed by the bourgeois Philibert, struggle against the decadent and corrupt Grand Company of the Intendant Bigot. Two ill-fated romances are interwoven: that of Amélie de Repentigny with Philibert's son, Pierre; and that of Le Gardeur (Amélie's brother) with the self-seeking Angélique des Meloises, who eventually persuades him to kill Philibert. This action precipitates the collapse of the colony. The novel mixes Gothic and historical romance with Québecois history and legend; it also provides insight into 19th-century English Canadian perceptions of French Canada's past. The Golden Dog was translated into French by Léon-Pamphile Le May as Le Chien d'Or: légende canadienne (Montréal, 1884; rev 1926). Glengarry School Days: A Story of the Early Days in Glengarry, by Ralph Connor (Charles William Gordon), was published in Toronto, New York and London, 1902.